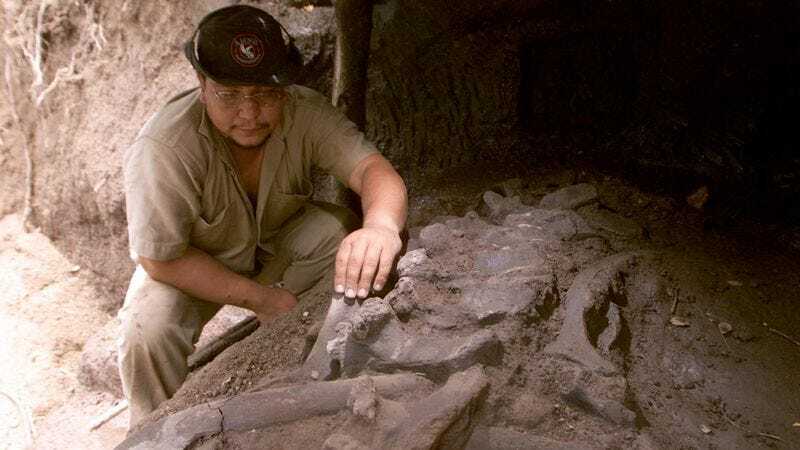 BERKELEY, CA—Citing compelling fossil evidence that the prehistoric species died suddenly and treacherously, paleontologists at the University of California, Berkeley announced Monday that dinosaurs were almost certainly killed by someone they trusted. “Our findings indicate that someone, we don’t know who, spent at least 150 million years gaining the confidence of dinosaurs before abruptly betraying them and taking their lives near the end of the Cretaceous Era,” said lead researcher Professor Janet Bower, adding that dinosaurs likely had an innately innocent and unsuspecting nature that this individual could exploit to get within easy striking distance. “The distribution and condition of dinosaur bones strongly suggests that these creatures died without a struggle and that they had been caught totally off-guard by an individual they naively considered a friend. Those that had time to regard their killer were no doubt absolutely shocked.” Bower went on to suggest that if the mightiest creatures to walk the face of the earth could be wiped out by letting someone get close to them, humanity could too.